Motherwell were sucked right into the relegation mix as Dunfermline racked up their fourth consecutive SPL win. Jim O'Brien rifled in an angled shot and Scott Wilson found the net with a header inside the first ten minutes. Stephen Glass added a second half penalty before Well's Mark Reynolds was sent off for a deliberate handball. Goalscorer Wilson was dismissed for conceding a penalty - converted by Scott McDonald, who also saw red, while Jim Hamilton added a late header. The hosts are now one point behind St Mirren, with two games remaining, while Motherwell are five clear. Motherwell, who have won just one of their last 10 league games, entertain St Mirren at the weekend and Dunfermline travel to Inverness. Both sides will be counting the cost of losing players to suspension for such crucial matches. And Motherwell midfielder Jim Paterson looks certain to miss out after falling victim to a reckless challenge from Mark Burchill. In a whirlwind start to the match it took only six minutes for the Fifers to take the lead. Tam McManus sent Adam Hamill free down the left and the on-loan Liverpool teenager looped a cross to the back post, where O'Brien was waiting to smash the ball beyond keeper Graeme Smith. The hosts doubled their lead just four minutes later thanks to some poor defending from a set-piece. Glass lofted a 40 yard free kick into the penalty area and Wilson had an easy job of out-muscling Reynolds to steer a header into the bottom corner of the net. Moments later, Motherwell striker McDonald drove the ball low across the Pars' six-yard box, with the sliding Darren Smith only inches away from a connection. McDonald, who is to join Celtic in the summer, then missed a glorious chance to reduce the deficit. An incisive passing move, involving Brian Kerr and Smith saw the Australian released in the penalty box but he clipped a shot inches wide of the post. McManus was constant nuisance for the Motherwell defence and the Pars striker had Smith at full-stretch to tip over a curling free kick early in the second half. 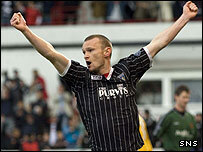 Dunfermline increased their lead on 56 minutes when Glass rammed in a penalty off a post after Jim McIntyre toppled under the challenge of Paul Quinn. Home keeper Dorus De Vries stuck out an arm to stop an angled drive from McDonald and got fingertips to a rising shot from Ross McCormack as Motherwell rallied briefly. However, any slim hopes of a comeback ended when Reynolds, who had a 20th birthday to forget, was dismissed for using an arm to prevent the ball falling for McIntyre in a threatening position. Motherwell won an 85th minute penalty when Wilson grappled with McCormack and McDonald tucked the ball away after the defender was sent off. 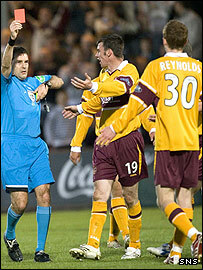 McDonald also made an early exit when he saw red for a wild lunge at Scott Muirhead. And Hamilton rounded off an eventful evening in Fife when he headed in a cross from fellow substitute Burchill. Dunfermline: De Vries, Shields, Wilson, Bamba, Glass, O'Brien (Daquin 74), Mason, Muirhead, Hammill, McManus (Hamilton 84), McIntyre (Burchill 71). Subs Not Used: McKenzie, Woods, McCunnie, Young. Goals: O'Brien 6, Wilson 11, Glass 58 pen, Hamilton 90. Motherwell: Graeme Smith, Corrigan, Reynolds, Craigan, Quinn, Vadocz, Kerr, Darren Smith (Fitzpatrick 71), Paterson (Keegan 80), McDonald, Clarkson (McCormack 54). Subs Not Used: Meldrum, Kinniburgh, McBride, McGarry. Sent Off: Reynolds (68), McDonald (88).